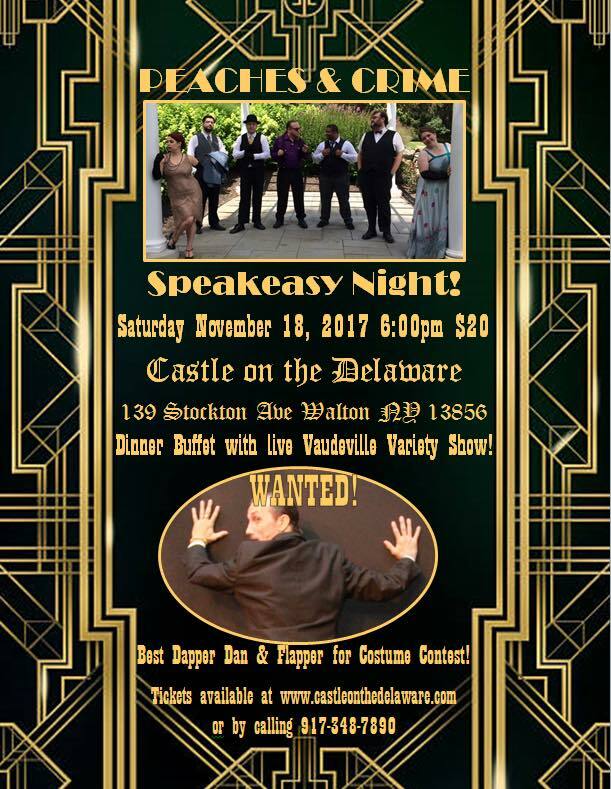 Dinner buffet with live Vaudeville Variety Show. Wanted! Best Dapper Dan & Flapper for costume contest! 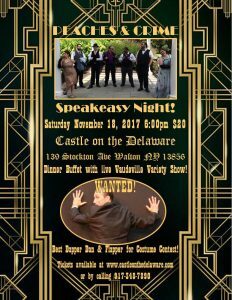 The deadline to purchase tickets online for "PEACHES & CRIME Speakeasy Night" on November 18th has passed. Tickets may still be purchased at the door for $20 each. The deadline to purchase tickets online for "Knight in the Castle" 2017 has passed. Tickets may still be purchased at the door for $20 each. 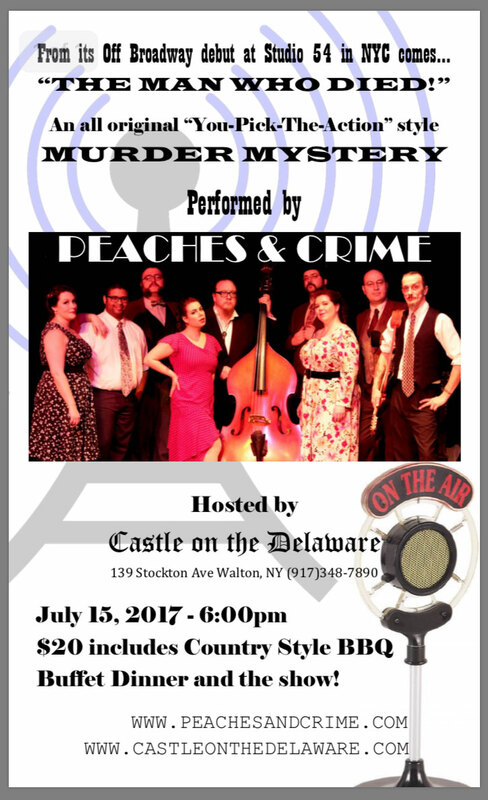 From its Off-Broadway debut at Studio 54 in NYC comes… “The Man Who Died!” An all original “You-Pick-The-Action” style Murder Mystery, performed by Peaches & Crime on July 15, 2017, 6PM. 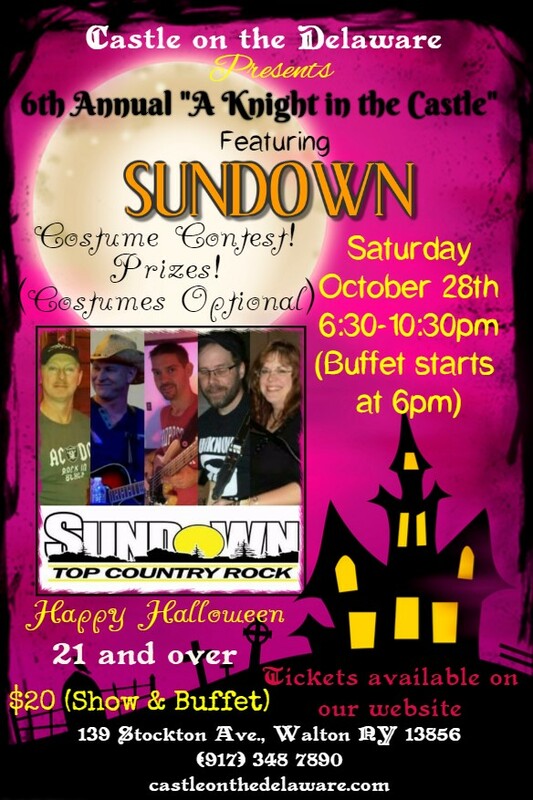 $20 includes Country Style BBQ Buffet Dinner and show! Buy tickets online using form below. The deadline to purchase tickets online for "The Man Who Died!" 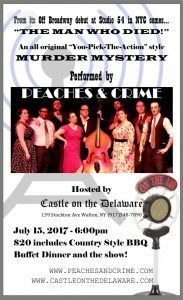 Murder Mystery on July 15th has passed. Tickets may still be purchased at the door for $20 each. 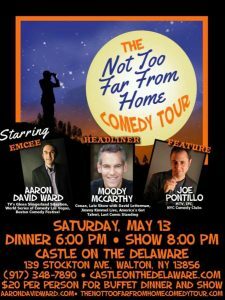 The Not Too Far From Home Comedy Tour starring Aaron David Ward, Moody McCarthy and Joe Pontillo – Saturday, May 13, 2017 at 8PM. $20 per person for Buffet Dinner (6PM) and Show (8PM). Buy tickets online using form below. The deadline to purchase tickets online for "The Not Too Far From Home Comedy Tour" on May 13th has passed. Tickets may still be purchased at the door for $20 each. Castle on the Delaware Presents “Shakey” Neil Young Tribute Show on Friday, April, 21, 2017, 8PM-10:30PM. $20 Show & Canadian Dinner (starts at 6PM). Buy tickets online using form below. 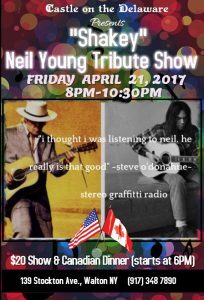 The deadline to purchase tickets online for "Shakey" Neil Young Tribute on April 21st has passed. Tickets may still be purchased at the door for $20 each. Celebrate New Year’s Eve with RUKKUS! Get discounted tickets online for RUKKUS on New Year’s Eve!! There will be a Prime Rib buffet and live rock and roll all night long into 2015. Join us for a great evening! Joint Effort is back to rock the Castle walls once again! Come for a night of classic rock on the Delaware! Featuring Ernie Kinch, Frank Slocum, Chris Grace, and Jeff Armstrong. Halloween Party and Dance with Blues Maneuver. 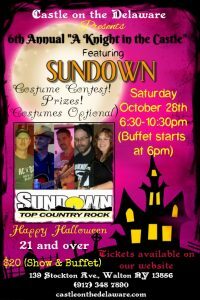 Cash prizes for best costumes. $20 cover charge includes buffet ($18 online). Discounted price if you buy tickets online – click here. 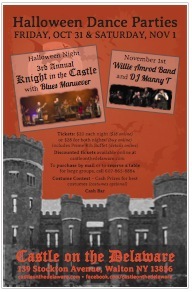 3rd Annual “Knight in the Castle” Halloween Party & Dance – Friday, October 31st – 3rd annual costume party! Don’t want to wear a costume? Then come as you are and enjoy the fabulous music of Blues Maneuver and a delicious dinner buffet. Willie Amrod Band – Saturday, November 1st – Enjoy the funk-based fare with roots in rock and country flavors, and environmental themes. Advanced ticket sales have closed. Please buy your ticket at the door. Enjoy the Willie Amrod Band Saturday November 1st– his funk-based fare has roots in rock and country flavors, and environmental themes. 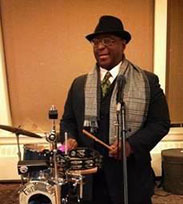 Joining the Amrod Band is our friend Abraham Dennis. DJ Manny T will play music during breaks and after the show. $20 buffet – ($18 online or just $10 for Friday night ticket holders) Discounted price if you buy tickets online – click here.